Widely lauded for their potent products in publications like Elle, InStyle, InTouch Weekly and OK Magazine Inance Skincare now launches a long-lasting, chemical-free nail polish line. Fort Lauderdale, FL - September 29, 2014 - From commercials featured in Times Square to inclusion in Oscar gift bags and recognizable fashion publications Inance Skincare is an acknowledged industry game-changer. Known for their dedication to revolutionary skin care and anti-aging products the company has made its way into the daily beauty regimens of women from all walks of life. Now, the company takes another leap. Producing an anti-chip nail polish that’s chemical free, the skincare company announces the launch of their dynamic 5 Free Nail Polish line. Already enjoying the benefits of creating beauty products that give women cost-effective high-end results, the company launches itself into the wholesale nail polish market. Offering fifteen brilliant colors with the most advanced chip-resistant formulation. 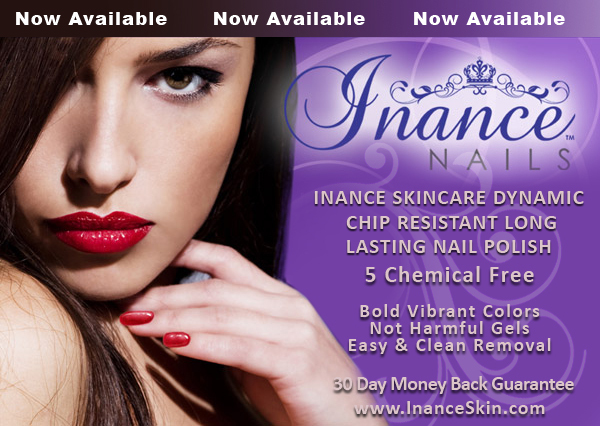 Inance Skincare makes gel nail polish manicures a thing of the past. The 5 Free Nail Polish line is just that, free of five harmful chemicals. Chemicals that should be at forefront of consumer’s minds, detrimental as they may be. The 5 Free polish is free of formaldehyde, formaldehyde resin, toluene, camphor or DBP. Offered with a 30 day money back guarantee 5 Free Nail Polish comes in show-stopping colors. Some colors include My Blue, Orange Crush, Purple Heart, Red Cab and trendy silver Tinsel Town. Inance Skincare is a skin care company that offers high end skin care products as well as over the counter items. Products address hyperpigmentation, fine lines and wrinkles, exfoliation, acne and common skin care concerns. Widely recognized in mainstream publications like Ok Magazine and InStyle, Inance Skincare was recently seen in a national commercial with Gretchen Christine Rossi from The Real Housewives of Orange County television program.